1. Benefits: The Bono Bus card offers savings of up to 30-50% on bus travel across the island. It’s easy to use, just swipe your card in the machines on board. The discount fare and balance left on the card will then be printed on the back. It’s available from bus stations, terminals, and retail outlets including newsagents. The Bono card also gives you discounts in some museums. 2. Applicable attractions: Available for use in all TITSA buses and attractions including the Science Museum. 3. 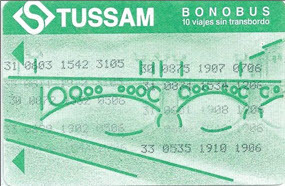 Card Price and Validity: Cards cost either 12€ or 30€ and are valid for one year or until the maximum number of journeys has been made (up to 18). This is the most that can be printed on the card. The lower price card is suitable for most holidays unless you plan on making a few long journeys with the more expensive option. 1. Benefits: The Green Banana Card offers discounts on hundreds of shops, restaurants, excursions and services across Tenerife as well as Gran Canaria, Fuerteventura, Lanzarote and Salou. It’s available as either a Smartphone app to download or as a physical card. Just show your card to the server at the point of purchase to get your discount. Most savings are of 5-20%, but some offer up to 50% off. 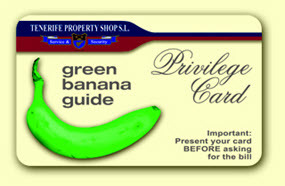 They are all listed in the Smartphone app and the downloadable Green Banana Guide magazine. The app constantly updates to show nearby savings and the user will receive daily news of special promotions. 3. Card Price and Validity: A card costs 17€ for a maximum of 30 days and there is no limit on how many times it can be used. Group discounts are available, for example in a restaurant the discount will apply to the entire group, not just the card holder. 4. Online Purchase Benefits: Downloading from Google Play means the card is available instantly for greater convenience. Visit the website to find out more. Duration: Dinner in Vilaflor and stargazing activity on Mount Teide last around 8 hours. Duration: The duration of the sightseeing cruise is around 4 hours and 30 minutes. Duration: The duration of the guided tour of Puerto de la Cruz by Segway is approximately 2 hours. Duration: The duration of this outdoor experience is between 4 and 6 hours, depending on the chosen provider. The hiking tour itself lasts around an hour.